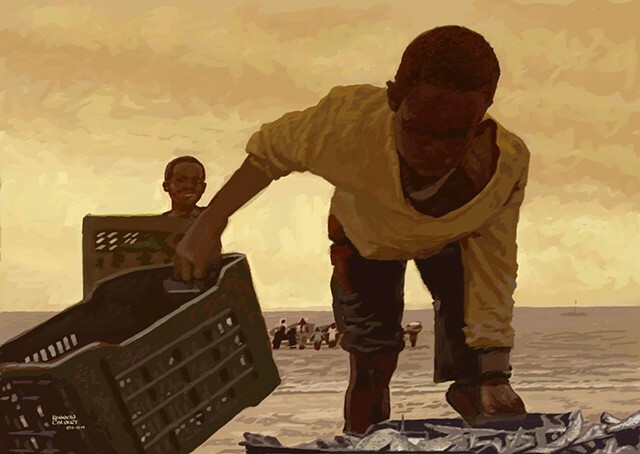 Street children in Mozambique are shown in this digital painting, unloading fishing vessels. In 2012, Mozambique made minimal advancement in efforts to eliminate the worst forms of child labor. Current social protection programs focus on raising awareness and on street children, but fail to address sectors in which children engage in dangerous work. Children in Mozambique continue to engage in the worst forms of child labor, including dangerous activities in agriculture and domestic service.